That's $750 toward airfare, hotels, car rentals and cruises when you redeem through Chase Ultimate Rewards®. ** From MONEY® Magazine, April 2018 © 2018 Time Inc. Used under license. MONEY and Time Inc. are not affiliated with, and do not endorse products or services of, Chase. This card has been fantastic. The sign up bonus was amazing. Great value added. I am obsessed with this card. The points are so easy to earn and so easy to redeem. I love how easy it is to transfer to travel partners, and so many of them! As a military family, we have used the travel protection when we get surprise orders after booking a trip. Keep up the great work, Chase! There are so many ways to redeem your points on Chase Ultimate Rewards®, your premier rewards program and travel booking site. As long as there's a seat on the flight or room at the hotel, you can book it through Chase Ultimate Rewards. Transfer your points to leading airline and hotel loyalty programs at 1 to 1 value. That means 1,000 Chase Ultimate Rewards points equal 1,000 partner miles/points. Count on 24/7 direct access to a dedicated customer service specialist from anywhere in the world. Rewards Program Agreement: For more information about the Chase Sapphire Reserve rewards program, view the latest Rewards Program Agreement. We will mail your Rewards Program Agreement once your account is established. If you become a Chase Online customer, your Rewards Program Agreement will also be available after logging in to chase.com/ultimaterewards. How you can earn points: You'll earn points when you, or an authorized user, use a Chase Sapphire Reserve credit card to make purchases of products and services, minus returns or refunds. Buying products and services with your card, in most cases, will count as a purchase; however, the following types of transactions won't count and won't earn points: travel purchases that qualify for the $300 Annual Travel Credit, balance transfers, cash advances and other cash-like transactions, lottery tickets, casino gaming chips, race track wagers or similar betting transactions, any checks that access your account, interest, unauthorized or fraudulent charges, and fees of any kind, including an annual fee, if applicable. 3 points ("3X points") on travel purchases: You'll earn 3 points for each $1 after the first $300 is spent annually when your card is used for purchases in the travel category. Therefore, any purchases that qualify for the $300 Annual Travel Credit will not earn points. "Annually" means the year beginning with your account open date through the first statement date after your account open date anniversary, and the 12 monthly billing cycles after that each year. 3 points ("3X points") on dining at restaurants: You'll earn 3 points for each $1 spent when your card is used for purchases in the dining at restaurants category. 1 point ("1X points"): You'll earn 1 point for each $1 spent on all other purchases. How you can use your points: You can use your points to redeem for any available reward options, including cash, gift cards, travel, and products or services made available through the program or directly from third-party merchants. Redemption values for reward options vary. Points expiration/losing points: Your points don't expire as long as your account remains open, however, you will immediately lose all your points if your account status changes, or your account is closed for program misuse, fraudulent activities, failure to pay, bankruptcy, or other reasons described in the terms of the Rewards Program Agreement. Rewards Categories: Merchants who accept Visa/MasterCard credit cards are assigned a merchant code, which is determined by the merchant or its processor in accordance with Visa/MasterCard procedures based on the kinds of products and services they primarily sell. We group similar merchant codes into categories for purposes of making rewards offers to you. Please note: We make every effort to include all relevant merchant codes in our rewards categories. However, even though a merchant or some of the items that it sells may appear to fit within a rewards category, the merchant may not have a merchant code in that category. When this occurs, purchases with that merchant won't qualify for rewards offers on purchases in that category. Purchases submitted by you, an authorized user, or the merchant through third-party payment accounts, mobile or wireless card readers, online or mobile digital wallets, or similar technology will not qualify in a rewards category if the technology is not set up to process the purchase in that rewards category. For more information about Chase rewards categories, see www.Chase.com/RewardsCategoryFAQs. When you use points to redeem for cash, each point is worth $.01 (one cent), which means that 100 points equals $1 in redemption value. Each point you redeem for travel booked through Chase Ultimate Rewards is worth $.0150 (one and a half cents), which means that 100 points equals $1.50 in redemption value, and points are worth 50% more than if redeemed for cash. For example, 50,000 points are worth $750 towards travel, or $500 when redeemed for cash. The cost of travel is based on the rates and fares available through the Ultimate Rewards website and travel center, and may not reflect all rates and fares that are available through other sales channels. A statement credit will automatically be applied to your account when your card is used for purchases in the travel category, up to an annual maximum accumulation of $300. Annual means the year beginning with your account open date through the first statement date after your account open date anniversary, and the 12 monthly billing cycles after that each year. (For applications submitted before May 21, 2017, annual means the year beginning with your account open date through the first December statement date of that same year, and the 12 billing cycles starting after your December statement date through the following December statement date each year.) Call the number on the back of your card to see when you are eligible for your next $300 Annual Travel Credit. Purchases are when you, or an authorized user, use a card to make purchases of products and services. Buying products and services with your card, in most cases, will count as a purchase; however, the following types of transactions won't count: balance transfers, cash advances, travelers checks, foreign currency, money orders, wire transfers or similar cash-like transactions, lottery tickets, casino gaming chips, race track wagers or similar betting transactions, any checks that access your account, interest, unauthorized or fraudulent charges, and fees of any kind, including an annual fee, if applicable. We do not determine whether merchants correctly identify and bill transactions as being of a certain type. For more information about Chase rewards categories, see chase.com/RewardsCategoryFAQs. Statement credit(s) will post to your account the same day your travel category purchase posts to your account and will appear on your monthly credit card billing statement within 1-2 billing cycles. The Annual Travel Credit will be issued for the year in which the transaction posts to your account. For example, if you pay for baggage fees, but the airline does not post the transaction until after the current annual period ends, the cost of the baggage fees will be allocated towards the following year's Annual Travel Credit maximum of $300. One time activation required. Priority Pass Select membership includes access to airport lounges, restaurants, cafes and markets participating in the Priority Pass Select network. There is no additional cost to activate your membership and certain terms, conditions and exclusions apply. Primary Cardmembers and Authorized Users are granted complimentary access to the Priority Pass lounges and are allowed a maximum of two accompanying guests each. For any additional guests, your card will be charged $27 per guest, per visit. Your card will be charged after you have signed for the additional guest visits in the participating lounge and the visits have been reported to Priority Pass. Access may be denied if the lounge is at capacity. Participating lounges are owned and operated by independent third parties and their participation and/or facilities may change. To access a lounge, member must show his/her valid Priority Pass Select membership card. Priority Pass Select membership is subject to the Priority Pass Select Terms and Conditions. Your Chase Sapphire Reserve account must be open and not in default to maintain membership. For complete Priority Pass Select Terms and Conditions and a listing of participating lounges, restaurants, cafes and markets, please visit www.prioritypass.com/select. To be eligible for this statement credit you must use your Chase Sapphire Reserve card to either complete the Global Entry application and pay the $100 application fee, or complete the TSA Pre✓® application and pay the $85 application fee. A statement credit will be processed after the Global Entry program application fee OR TSA Pre✓® application fee (whichever program is applied for first) is charged to your Chase Sapphire Reserve card. You are entitled to either: one (1) $100 statement credit per account, OR one (1) $85 statement credit per account, every 4 years in connection with the Global Entry or TSA Pre✓® program application fee. The statement credit will be posted to your account within 24 hours of the Global Entry or TSA Pre✓® program application fee being charged to your card. You are responsible for payment of all charges until the statement credit posts to the account. Global Entry is a U.S. Government program, operated by U.S. Customs and Border Protection (CBP). TSA Pre✓® is a U.S. Government program, operated by the U.S. Transportation Security Administration (TSA). Chase has no control over either program including, but not limited to, applications, approval process or enrollment, or fees charged by CBP or TSA, and no liability regarding the Global Entry or TSA Pre✓® programs. For complete details on the Global Entry program, including full terms and conditions, go to ttp.cbp.dhs.gov. For complete details on the TSA Pre✓® program, including full terms and conditions, go to tsa.gov. Websites and other information provided by government agencies are not within Chase's control and may not be available in Spanish. The statement credit benefit applies to the Global Entry or TSA Pre✓® programs only. Other program applications including, but not limited to, NEXUS, SENTRI, and Privium are not eligible for the statement credit benefit. To be eligible for this benefit, your account must be open and not in default at the time of statement credit fulfillment. The Luxury Hotel & Resort Collection (LHRC) program benefits and Guest Privileges are available exclusively on select Chase credit cards. To receive the Guest Privileges, reservations must be made through an LHRC Travel Specialist or on the LHRC website via Ultimate Rewards. Websites and other information provided by LHRC and/or participating hotels are not within Chase's control and may or may not be available in Spanish. All exclusive amenities and Guest Privileges are provided per room and are based on double occupancy. Some amenities may only apply to select rates, may be subject to availability at check-in, and are not redeemable for cash. Amenities may not be combined with other offers, including tour operator or wholesaler rates and packages. Complimentary Wi-Fi provided, with the exception of Mombo Camp where Wi-Fi is not available. Program benefits, participating properties, and Guest Privileges are valid through the current calendar year, but may become unavailable due to circumstances outside of Chase's control. All efforts have been made to ensure the accuracy of the information contained. We reserve the right to correct any mistakes. Certain blackout dates and other restrictions may apply. This program is brought to you by Chase through an agreement with Signature Travel Network. Accounts subject to credit approval. Restrictions and limitations apply. 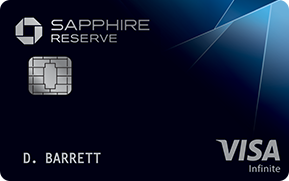 Chase Sapphire Reserve credit cards are issued by Chase Bank USA, N.A. Offer subject to change.